As children we are told that we could find a pot of gold at the end of the rainbow. Years later after a couple science classes, you realize that the ends of rainbows are always moving depending on where the viewer is standing. That’s when the term “chasing rainbows” clicked in my head. It doesn’t matter. I still look for rainbows after the storm. Its no wonder that the rainbow flag as been a symbol of hope and social change throughout history. 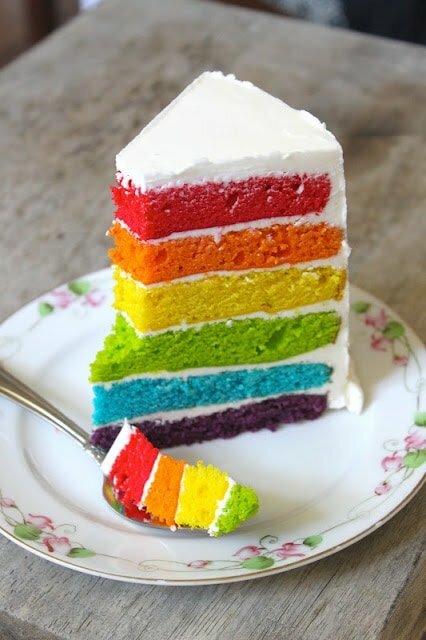 Which brings me to the real reason I made this rainbow cake. Last week, Proposition 8 was overturned in California! Its a small step, but a step forward nonetheless. I think this is the perfect celebration cake for this momentous event. On the outside it seems like a boring vanilla white cake. But once you slice into it, you get this surprising happy pop of color and excitement. I am a firm believer of equality. History has shown us that progress takes time. Look how long it took for women to gain the right to vote. How about how long it took before interracial marriage was legal in all states of the US? This is a baking blog, after all, so I will not delve too much into the controversial or political topics. But this happens to be a matter very near and dear to my heart. In the end, I think it all boils down to love. Love is hard enough to find. Those who find it and very lucky and fortunate. So, why deny people in love the right to get married? I was taught that love is something to be treasured, something to be celebrated, and something to be proud of. Any one who has ever fallen in love knows that you cannot choose who you fall in love with. This battle for equality will be my generation’s Loving vs. Virginia. I suggest looking it up. It was something that really struck a chord with me when I learned about it in college. My favorite quote ever: “Le coeur a ses raisons que le raison ne connait pas.” Translated meaning, the heart has reasons that reason does not understand. In any language, time period or alternate universe, love is love and it doesn’t need an explanation. Just because you don’t understand something doesn’t mean its not right. Equality takes time. Progress takes time. Just like everything else that happened in history, it takes time. Change just doesn’t happen overnight. You can’t lose hope. I’m very optimistic. In my book, the good will always prevail– just look to any comic book super hero for validation. This is a cake about happiness, peace, and equality. There is nothing sad about rainbows and all those beautiful colors in harmony together. Preheat oven to 350 degrees F. Gather as many 9” round cake pans as you can find. I only had two, so I had to clean the pans between baking. 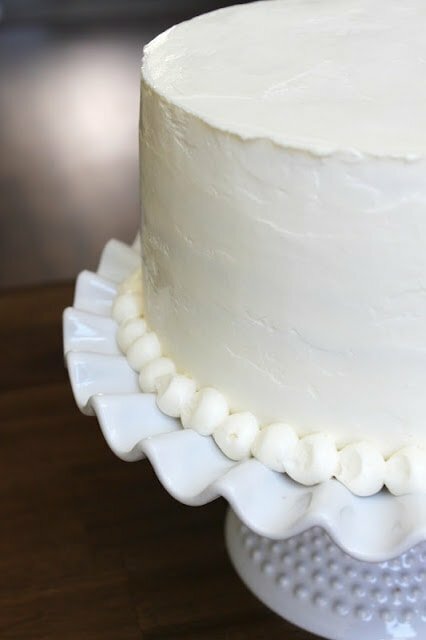 Butter and line the cake rounds with parchment paper rounds. Set aside. In a bowl of a stand mixer with the paddle attachment, cream butter. Add sugar and continue to cream until lighter in color. Slowly add egg whites to the butter on low-medium speed. Add vanilla paste and sour cream. Mix until thoroughly combined. Alternate adding flour mixture and milk to the creamed mixture. Add the flour in three additions, beginning and ending with the flour. If you have a kitchen scale, transfer the batter to another bowl and weight it out. Take the weight and divide it by 6. My total weight was 1530 grams. Divide by 6, it was 255 grams. Measure of 255 grams of batter into 6 small bowls. If you don’t have a scale, it was roughly 3/4 cup of batter into 6 bowls. Add food coloring to individual bowls. I used about 4-8 drops of coloring for each. Some colors required more gel than others to get the vibrant hues I wanted. Be sure to use food gels. Adding liquid food coloring will make your batter too runny and thin. I use AmeriColor Soft Gel Paste Food Color. Be sure to use food coloring GEL. Please do not use liquid food coloring. The batter will be too thin and not bake off properly. In a saucepan, combine sugar and water. Stir until it resembles wet sand. Set to high heat and cook and cook until candy thermometer reads 245 degrees F. While the heat is on, DO NOT stir or disturb the sugar solution. Agitation will cause unwanted cystallization. If any sugar splashes onto the sides of the saucepan, use a clean pastry brush soaked in water to dilute any crystal formation. While the sugar is cooking, whip the egg whites in the bowl of a stand mixer with a whisk attachment. Keep it at low speed until whites are foamy (it should look like the foam on top of beer). Once foamy, begin whipping at medium speed. Before you add the sugar, lower the speed slightly. Once sugar reaches 245 degrees F, pour it into the whipping egg whites in a slow and steady stream. After all the sugar has been added, increased the speed to high. Continue to whip until the mixing bowl is slightly warm than room temperature to the touch. Turn down the mixer to medium speed and slowly add the butter, a couple cubes at a time. Continue to whip at medium speed until all the butter has been added. Whip until buttercream is smooth and creamy. If you add the butter when the meringue is too hot, it may melt and the buttercream may not emulsify. If this happens, place the mixing bowl in the freezer for a couple minutes to cool down the mixture. Once cooled, started whipping again. If the butter is too cold when added to the meringue, the buttercream may end up chunky. Use a torch to warm the bowl or place over a bain-maire to soften the butter. 1. Place the purple layer of cake on a cake board. Spread a rounded 1/4 cup of buttercream on top. Repeat with blue, green, yellow, orange and red. 2. Use 1/2 a cup of buttercream for the crumb coat of the cake. Let chill in the refrigerator for 15 minutes. Once chilled, coat the cake with another layer of buttercream. This is so beautifully written and I am with you 100%! You were able to make some wonderful points here without bashing the other side. What a perfect cake to celebrate this occasion, or at least the step in the right direction. Woo hoo! What a beautifully written post! I loved the quote too – why have I never heard that one before? And I agree with you 100%. I know that love is not something anyone can choose and some people search a lifetime for it. If someone is lucky enough to find that love then why not allow them the equality to fortify it? 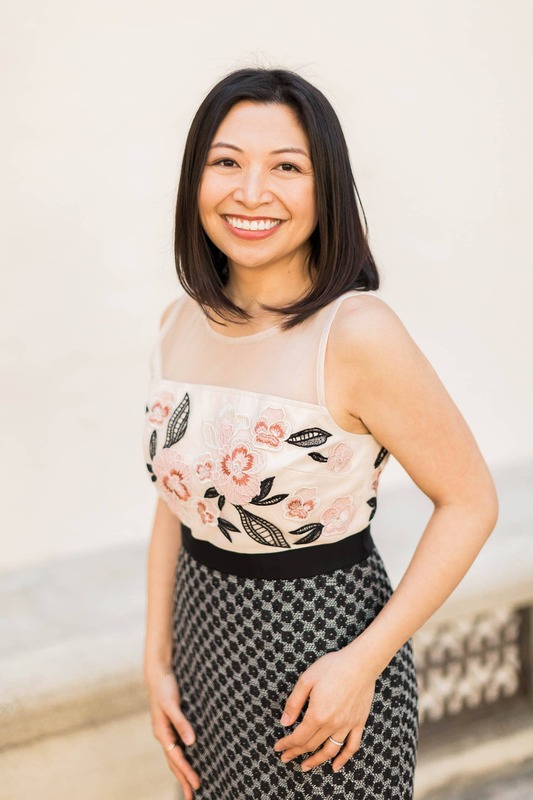 Unfortunately none of my family agrees with me on that – sadly – so it’s so refreshing to find a fellow blogger who mirrors my own views so well! I was obsessed with everything French in high school and came across that quote. Isn’t it wonderful?! I’m so happy you agree. I was a bit scared that I’d shun some readers away, but so glad you found me! 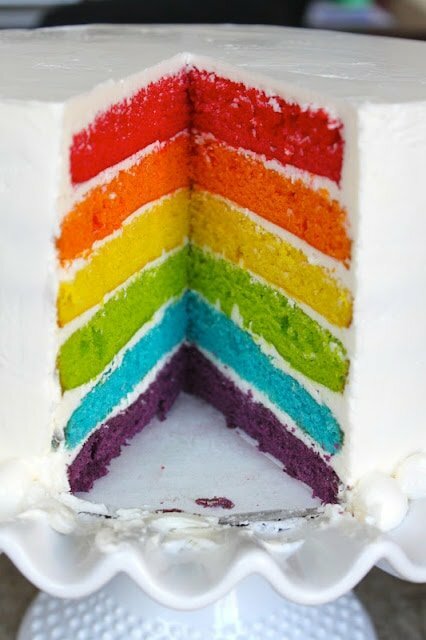 I am sooooooo impress of this rainbow cake of yours! So beautiful color. Thank you! The secret to the color of the cake is all in the food gel paste! 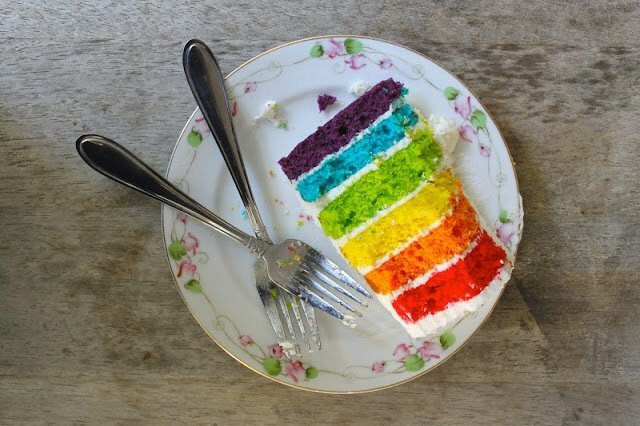 There’s nothing like a rainbow equality cake to make your day right! Great blog, great cake, great message of equality. There’s a documentary tonight on Loving V. Virginia on HBO if you get a chance to watch. I love cakes like this! So colorful and fun! Lovely post. Thank you! Its such a lovely cake to eat for breakfast. It perks me right up! The cake is visually stunning…and I’m sure delicious. As for the other matter, I never understood why anyone thinks they have the right to dictate in what manner someone else chooses to be happy. But then again, I don’t understand a lot of what people think is their business to dictate to others…on any subject. Happy Valentine’s Day! Thanks, Anita! Its so great to hear others feel the same way. Seriously, some people just need to mind their own bee’s wax. Everyone should be able to live their life as they see fit. Hope you had a very happy Valentine’s day! That cake is gorgeous – it looks absolutely perfect! Great post and a beautiful cake to wrap it all together! Well done! Thanks, Danny! So glad this post has gotten me new readers! All I can say is just. . . bravo. Seriously. Bravo. Thank you, Katherine! Having people leave such great comments makes me happy I wrote this post. Wonderful post! What a happy cake too, now that is a celebration! how perfect are those colors and a perfect celebration for the day. A truly beautiful post. i love that quote. Thank you, Richa! Isn’t it such a great quote?! Glad you like it! Found your blog via the lovely image above on Pinterest. The cake is gorgeous (going to attempt it for a party in a couple of weeks), the message is lovely (I’ve never understood the hate!) and the rest of your blog is downright delicious! I’m in Seattle (gay marriage signed in to law 2 weeks ago!) and see you visited recently. Glad you had a yummy trip! Many thanks, Emily! So glad you found me. YAY for Seattle! That’s awesome :) Yes, so many yummy places in Seattle. Hi Iren. If you read the recipe you would have noticed the link I had to the original website. You must have missed it. Sorry, I really missed it. When I compare these two cakes, I prefer your version, because there is more cake and less buttercream in between. The colours also look more vibrant this way. Anyhow, it is just a beautiful cake – I love it so much! hi, can i use icing colors for the cake batter? or is it a must to use food colouring? Hi, Jayi. Icing color should also work. I think its pretty much like gel paste. Its more concentrated than liquid food coloring, so you won’t be adding too much water to the batter. I prefer using gel paste coloring because it doesn’t alter the taste of the cake after baking. I hope that helps! How did you cut your cake so neatly? With no icing getting on the cakes, and no crumbling? Was the cake cold? Knife hot? What type of knife? Thanks, Maddie! I use a very sharp 8-inch chef’s knife. The cake was cut at room temperature. I also used the knife at room temperature. I only warm up my knife when cutting cheesecakes and mousse based desserts. How soon before serving should this cake be made? 1/2 days? I’m going to make it for Monday but could do making it Monday if possible? You can make the cake layers up to two days in advance as long as the cake is wrapped well. Wrap each cake layer individually, or you can stack them with parchment paper in between each layer. Keep the wrapped cakes at room temperature. Making the different colored cake batters takes the longest time. It should only take an hour or two to completely build and frost the cake. You can make the cake a day before serving it. Also, does it need to go in the fridge overnight? I would refrigerate the cake. I don’t feel too comfortable leaving it out because of the egg whites and butter in the frosting, especially with the heat in Southern California. If you do decide to refrigerate it, be sure to let the cake sit at room temperature for 15 minutes or so to soften. Approximately how many people does this cake feed? The cake serves 12-15 people. More if you cut thin slices since the cake is pretty tall. I will definitely try your recipe :) quick question I need to double it to feed +/- 30 people… Should I use bigger pans or the best choice would be doing 2 separate cakes ? I suggest doing two cakes. maybe an 8/9 inch and a smaller 6 inch cake. Hi Imelda. Yes, the weight of a cup of sugar does not equal the weight of a cup of flour. Yes, you can use cake flour. Use 1 cup plus 2 Tbsp of cake flour for every cup of all-purpose flour. Yes, you can exchange the sour cream with yogurt but you may get a different result. I prefer using sour cream with this recipe. Hi Rachel. Thanks for trying out the recipe! I used Americolor Soft Gel Food Paste coloring. I used their electric colors series because I find them to bake more vibrant that their regular colors. I used no more than 1 tsp of each gel color. As for the layers, make sure each cake layer is flat level. I had to trim off some of cake tops. Also, make sure the layer of frosting on top of each cake layer is flat and level. You could also press down on each layer of cake as you build it to ensure it sticks to the frosting below it. I suggest adding some salt to the buttercream, and vanilla extract/paste or citrus zest… something to give it some kind of flavor. If you want the vibrancy of the cake colors like in the picture you will need to add quite a bit of gel paste, especially to the red, blue and purple. What you see raw is mostly what you will get baked, so don’t be shy with colors. I used parchment in the bottom of three cake pans and reused the parchment for the second time around, and I didn’t wash my cake pans between uses. This cake came together very easily. Hi! No, I did not double the cake recipe. I used a 9-inch cake round to do each layer. This is just an absolutely lovely cake! I’m planning on making it for Easter, replacing the red layer for a bright pink! Do you think I can color the frosting a light pink? And does the icing harden, or does it stay sticky? I want to add some Easter decoration to it, like possibly dying some coconut green and adding some jelly beans. Maybe some marshmallow chicks. Can you please help me with answers to these questions so I know ahead of time what I need to do. Thank you so much, and I really enjoy your blog! Thank you for this recipe, and also, I loved your comments…I agree wholeheartedly! No one has the right to decide how another should live. I’m from Spain and a stick of butter here has 250 gr. So how many grams of butter should be used for cake recipe? Hi Sonia. Each stick of butter is 4 oz. 1 1/2 sticks would be 6 oz and I think that converts to 160 grams. I made this cake yesterday for my wife’s 30th birthday, and man! Wow! It was the first time I made a cake not from the box, though I confess that I cheated and used store-bought frosting. The batter was extremely thick, and I think as a result, the cake came out dense, but maybe all from-scratch cakes are like that? I used the same food coloring gel as you, but the colors weren’t as vibrant as yours. I think also, because the batter was so thick, I had a hard time getting it level in the pans, so some of the layers baked up unevenly. Overall, though – fantastic! Thank you for posting this recipe! I used quite a lot gel coloring to get it that vibrant color. Using an mini offset spatula really helps to level the batter in the pans. If that doesn’t work, give the batter filled pans a good thump on the counter to loosen it up. Hi! I’m from Peru and I just made the cake today! it was my first time doing the rainbow cake, and everything was all right, the cake was delicious! The only thing we didn’t like was the meringue…I think 18 oz of butter is too much! is the recipe correct or maybe yo made a mistake writing it? I will try the next time with half the amount of butter. I’m sorry to hear that! I’ve used this recipe several times with good results. I never thought I’d cry when reading a cake recipe, it is just so well written, thank you. Can’t wait to try to make the cake! Can’t wait to make this for my daughters 5th birthday! Can I get this soft gel paste just at my local grocer or is it something I would find in a specialty store? Thank you for sharing your recipe. Happy early birthday to your daughter! I suggest going to a specialty store to find the soft gel paste. Several craft stores also carry it and it is readily available online. Hi Aimee. Yes, I would NOT suggest making this for a wedding. The dyes from the cake will likely turn your tongue a different color. I usually reserve this cake for children’s parties and birthdays. I’d stick to the white cake for the wedding :) Hope that helps! Hi! I love your cake and what it represents! I am making the cake for my twins’ 1st birthday party. I’m not sure where I can buy the americolor soft gel paste or the vanilla paste in local stores, any suggestions? I am finding them online, but I can’t find the “royal purple” color at all. For the other colors it seems like I will have to buy them individually bc they don’t come in a package together. It ends up being kind of expensive. Any suggestions for that? Thank you! I really like this recipe! I’m making it for a friend’s surprise bridal shower. I made a test cake and it did not turn out well. One of the reasons, I realized, was because apparently I bought two 10-inch pans instead of two more 9-inch pans. But I noticed that even the 9-inch layers didn’t even fill the bottom of the pan. Any thoughts? Also, is the butter measurement correct for the frosting? That’s FOUR AND A HALF STICKS OF BUTTER. My girlfriend was the taste tester and thought it just tastes like butter, and she has a cold! The texture was originally like whipped cream until I chilled it. Is that right? It didn’t look as thick as in the picture. I haven’t made this cake yet, but I plan to. I need to feed a bunch of people, 30+ so I’m thinking of making 1.5X the recipe and baking it in a 10 inch pan. I was wondering if I could just use 3 whole eggs instead of whites only. I could see if you were not adding color to the cake, whites would keep the cake really white. Will whole eggs change it too much? No, you cannot substitute 3 whole eggs in place of 3 egg whites. Egg whites are composed of water and protein, where as egg yolks are made of fat. Using whole eggs will greatly affect the resulting cake. I have never tried the recipe with whole eggs. That being said, if you’d like to give it a try, I’d love to hear how it turns out. Hi Sara, I’m sorry to hear that. I’ve made this cake numerous times without fail. Thanks for the awesome recipe! Was a hit for my daughter’s 5th birthday party! Thanks for trying out the recipe! Hmm…not sure why the colors changed, but at least it tasted good! Love this cake!! it´s really pretty!! I haven’t tested it, but you can substitute full-fat greek yogurt in place of sour cream. hi again! when you say 1 1/2 sticks you meant 1 stick – 113 g (1/2 cup) and half of 1 stick 57 g (1/4 cup)? or is it 1 block- 227 gm (1 cup and 1 stick- 113 g (1/2 cup)? im a little confused. and pls reply back t my sour cream trouble its s hard to find one in our local grocery,. im from the province here in the philippines so the ingredients are a kinda limited hehe thanks maryanne!more power! 1 1/2 sticks of butter = 3/4 cup butter. Hello, thanks for the recipe! I have a question. Please tell me is the recipe suitable for 23 sm baking pan or the ingrediants need to be added? Thanks. Yes, 23 cm is equal to 9-inches. I had similar results as others who tried to make this cake. Very thick batter that doesn’t fill the 9-inch cake pan and results in very thin dense cake. You would need twice the amount of batter to make this the way it looks in the picture. 3/4 cup per cake pan is no where near enough batter. what weight is one stick of butter? One stick of butter is equal to 4 ounces or 115 grams. Hi the first time I’ve made this cake layers are only I have an inch thick is that correct? I don’t think it is. And how many people will this cake serve I need to be able to serve 26? I need it for this Saturday, 16 March.